Stick with me - there's a giveaway in here somewhere! 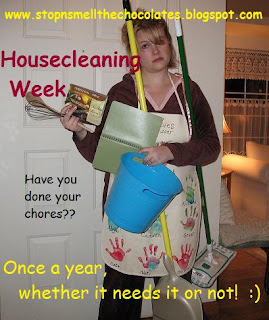 :) I know, I know - I didn't even warn you that it would be Housecleaning Week! That's because I only realized it a few days ago. My man suggested it actually - though he meant OFF the blog! ...oh... But that gave me an idea - if I included some assigned projects and my progress at the top of my regular posts this week, I would have more accountability. And If I really focus and go crazy with cleaning for just one week, it won't kill me - right? I even thought of a new motto - If I make it fun, I'll get it done! LOL! Here's how the week will work. Each day - at the top of my regular post I will have a project that I'm assigning myself for the day (in addition to my regular cleaning) and the progress of the previous day's project. But THEN, I will have a couple of short and easy assignments for YOU - yes YOU - to do so you can join me in the housecleaning fun! I promise they'll be easy and you'll feel like you accomplished something during your blog-reading time AND husbands everywhere will like my blog - LOL! Got all that? Good! Go grab your apron and join me for the first post of the week, and a giveaway! YOUR assignment #1: Throw away 10 items from your purse or wallet. YOUR assignment #2: Organize and clean your silverware tray. Here's what I want you to do - go do your assignments NOW!! If you wait, you won't do them. Shouldn't take much more than 15 minutes! Then come back and read the rest of the post and enter the Purex giveaway (oops I gave it away already!). Thanks to MomSelect, I was helped with my laundry recently. 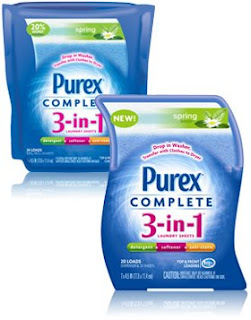 No, they did not send me a maid, but they did send me 2 free boxes of Purex Complete 3-in-1 Laundry Sheets - one box for me to try and one box for me to give away on my blog! I was excited to try these after seeing all the promotions and commercials! They work great! My clothes came out clean, soft and static-free. The biggest advantage I see is not having to buy detergent, softener, and dryer sheets - these take care of all of it. Wouldn't they be perfect for college students and people with very little storage space in their laundry area? In fact, they would be perfect for my Dad! And Purex has teamed up with Kivo.com to support women owned businesses around the globe. When you purchase a box, you have the opportunity to help support this program by going to www.purexchangeslives.com and entering your bar code. One random commenter on this post will win a box of Purex Complete 3-in-1 Laundry Sheets (20 in one box!). All you have to do is leave a comment and tell me if you did your assignments from above! This giveaway will be open through Sunday, August 9. I'll announce the winner on Monday. But you can all be "winners" by stopping at the Purex site and clicking on Get A Coupon - by giving your name and e-mail address, you'll get a $1 coupon! Happy Housecleaning my friends!! Stop back tomorrow to see my project progress, get your new assignments and read a Tea For Two-sday post! You don't hate me for making you clean with me, do you?? You have such a great humor - the picture is awesome. In terms of cleaning - uhh I am soo sorry but, how can I say, well I - have a cleaning lady. And being away from home from around 7am until 6pm - time is another factor. But I will be checking on your progress and you absolutely have my sympathy. Um....can I be excused from the first one? See I don't carry a purse and if I do it's only because I've started and I don't think I want to take those out! LOL. Are you laughing? And um.... the second thing I can't do right now because EVERYONE is still sleeping. Big can't do nothing for another hour size hugs to you! Yay, Monday is my cleaning day so I just added the tasks to my list. Check, check! And as a little unsolicited recommendation ... I love the Purex sheets! Tried them a few weeks ago as I began teaching my young daughter to do laundry. They are wonderful! Wow! Looks like I get a "get out of jail free" card on today's assignments. I cleaned out my purse on Friday and organized the silverware drawr about 2 weeks ago (and it's still good). Now, let's not talk about that pile of clean laundry that's been sitting at the foot of the bed for a week... OK, we will talk about it, headed there now. I would love to be entered into your giveaway. That would certainly make laundry chores easier for the children. I am so go to do these assignments this week. Our downstairs is the cleanest it has been all summer and now I need to work on the little stuff. I love the Purex sheets I find they work the best with smaller loads of laundry. Lisa, this is a fun and "encouraging" idea. Aside from the fact that Monday is ALWAYS my laundry day, I had to deal with a sick boy all afternoon and evening. Tuesday was filled with appointments and I took my oldest out to clean someone's house for money! Okay, because I am just starting, I need to catch up. Now, I have my purse emptied of at least 10 items. My silverware try was already organized, because we empty it practically every day. I decided to clean the drawer under it. It was dirty from spillage. So, I hope this counts. NOW on to Tues. I was just informed that another boy is ill. So, Lord willing I will tackle each day as I can. Thank you the great way to get things organized, follow you! Today, I did take things out of my purse. It was pretty easy to take at least 10 things out of my purse since I had a bunch of old receipts that I had to throw away. I also removed most of the change to lighten the weight of my purse. Okay dokie, I'm in for this "cleaning" it will be fun thing. I did accomplish both of the tasks and it was a good thing. Motivation is a good thing ! Oh and a contest doesn't hurt , does it. I've seen these advertised too and would love to give them a try for free ! Well, I just stopped by your blog about an hour ago, and went back downstairs to take care of item #1 and #2. Cleaned out my purse, and threw away MORE than 10 items. Cleaned the silverware drawer, and the plastic utensil drawer. I couldn't stop! LOL. But wanted to make sure I got my comment in. Lovely site. Glad I came across it.